This article was first published in 2006 by The Australian Sociological Association. To highlight some of the methodological limitations, this paper presents a critical analysis of empirical studies on suicide terrorism which apply Durkheim’s typology of altruistic suicide. The paper will then sketch an onging study of suicide terrorism that aims to go beyond the current ‘Western’ frameworks of understanding. The paper will show how, in trying to understand suicide terrorism, the complications associated with finding reliable and valid data on the subject are compounded by the way in which researchers and intelligence analysts fail to address the limitations of their methodology. The paper argues that data about suicide terrorism must be analysed within an explicit epistemological framework. It further argues that suicide terrorism must be understood in terms of social context, and in context of the researcher/analyst as a situated being, whose social location and culture affect the way in which they interpret data. The paper suggests that sociological studies in the areas of altruism, community identities, and the sociology of suicide may provide insight into understanding suicide terrorism as a social process. This framework represents an attempt to break down the process of ‘otherness’ that currently limits our understanding of terrorism. Suicide terrorism is perhaps the most public and controversial expression of suicide. Most researchers define suicide terrorism as politically motivated violence that necessarily requires the death of the perpetrator along with their target/s in order for the attack to be successful (Pape 2005: 9-11; Pedahzur et al. 2003: 417). Most terrorism studies exclude attacks by governments: they focus on ‘terrorism from below’ (insurgent groups and individuals), rather than on ‘terrorism from above’ (Webel 2004: 9; see also Horgan 2005: 21). The studies critiqued here are no exception. Also, researchers make a distinction between a suicide mission, where an attacker does not expect to survive and there is no escape plan or rescue mission (for example, where an attacker is killed by the police or other adversaries), and a suicide attack, where an attacker kills themselves in an attempt to kill others. All the studies cited in this paper focus on suicide attacks. To date, sociological analyses of suicide terrorism are largely concerned with describing the socio-economic backgrounds of suicide terrorists (for example see Pape 2005; Pedazhur et al. 2003). Supplementing this demographic data, most researchers and intelligence analysts tend to sketch the biographies and ‘psychological autopsies’ of dead suicide terrorists by drawing on media reports and journalists’ interviews with relatives and friends, by interviewing the terrorists’ surviving victims, and by conducting analyses of the terrorists’ public statements (for academic examples see Hafez 2006; Kimhi and Even 2004; Speckhard, et al. 2004; Speckhard and Ahkmedova 2006). These journalistic and ‘official’ organisational accounts of suicide terrorists’ lives are used to infer and quantify their motivations and personalities. It remains, however, that despite ongoing attempts, terrorist profiling (suicidal or otherwise) is not currently possible (see Horgan 2005). This paper draws on ongoing research that critically reviews the existing English-language empirical literature on suicide terrorism using a sociological theoretical framework. The paper will analyse two studies on suicide terrorism that apply Emile Durkheim’s (1979) classic typology of suicide. The paper aims to highlight some of the epistemological issues confounding studies of suicide terrorism. The paper will then sketch the design of my ongoing research that intends to go beyond current understandings of suicide terrorism. The paper argues that in trying to understand suicide terrorism, the complications associated with finding reliable and valid data on the subject are compounded by the way in which researchers and intelligence analysts fail to address the limitations of their methods. Suicide terrorism must be understood not only in terms of the cultural context in which it occurs, but also in the context of the researcher as a situated being, whose social location affects the way in which they frame their research questions and interpret their data. 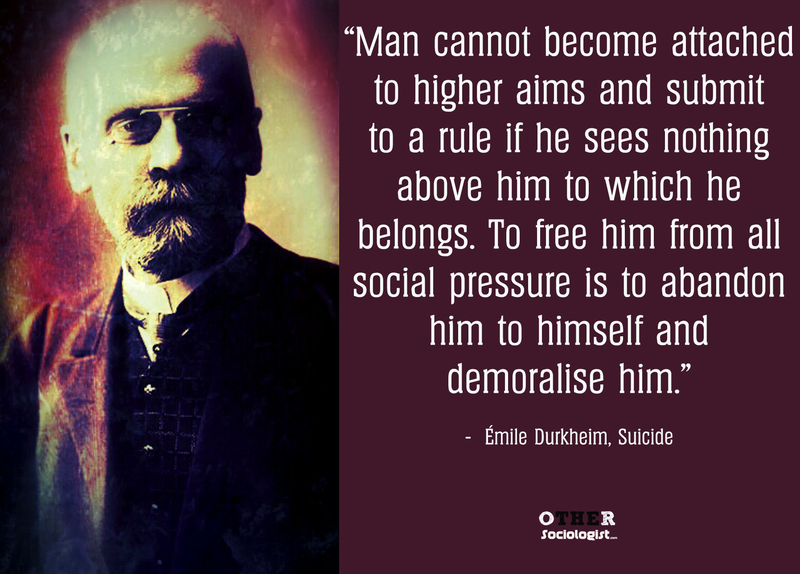 Originally published in French in 1897, Durkheim’s structural approach to suicide was removed from individualistic and moralistic perspectives, and instead, studied suicide as a social practice. He defines suicide as those deaths ‘resulting directly or indirectly from a positive or negative act of the victim himself [sic], which he [sic] knows will produce this result’ (1979: 44). He argues that individuals are not driven to suicide by psychopathology alone, but rather that society plays a strong role in motivating individuals towards, or away from, suicide. This motivation takes form as a collective tendency to suicide, or in a social ‘quota’ of suicides that differs across time and culture. Durkheim uses existing longitudinal data and other historical and anthropological sources from various (mostly European) countries, to understand the variations of suicide rates in different societies using statistical analyses. He examines suicide as a social process that interacts with other social institutions, such as marriage, religion, the economy and politics. Durkheim derives a threefold typology to describe suicide: egoistic, altruistic and anomic suicide. First, ‘egoistic suicide’ occurs in societies with excessive individuation, that is, those societies that lack social integration and where group membership is weak. Second, ‘altruistic suicide’ occurs in societies that have an excess of social integration. Third, ‘anomic suicide’ occurs in societies that lack social regulation, that is, those societies that do not exercise strong social control over its members. Durkheim cites a fourth category, ‘fatalistic suicide’, that he supposes may occur in societies where there is an excess of social regulation, but he is dismissive of its significance, so much so that it is only mentioned in a footnote and has been consequently omitted from his typology (1979: 276). Altruistic suicide describes a voluntary death that, in very specific circumstances, society deems significant of praise or prestige. It only occurs in societies where group membership is elevated above the individual’s self-worth. Durkheim finds that altruistic suicide is more common in ‘lower societies’ (that is, non-Western societies), because in Western societies ‘as individual personality becomes increasingly free from the collective personality, such suicides could not be widespread’ (1979: 228). He does, however, identify the military as the only context in which altruistic suicide is likely to occur in modern Western nations. Durkheim’s work has been greatly critiqued for over one century. Nevertheless, his comparative and scientific approach circumvents moralistic judgements about suicide, and his typology is an attempt to establish patterns of motivation for an act that is usually considered intensely private and highly personal. Suicide terrorism defies Durkheim’s typology of suicide because he did not consider suicides that resulted in the unwilling deaths of other people, and yet studies are beginning to apply this typology to the study of suicide terrorism. The studies discussed below have been chosen as case studies because they explicitly apply Durkheim’s typology in their analyses of suicide terrorism, where other studies simply infer notions of altruism, by referring to aspirations of ‘martyrdom’ or ‘death for the good of the community’ as motivators of suicide terrorism. Ami Pedahzur, Arie Perliger and Leonard Weinberg’s (2003) study of Palestinian suicide terrorism draws upon an Israeli database linked to The National Security Studies Centre, at the University of Haifa, Israel. Robert Pape’s (2005) study draws on a database including comparative data on suicide terrorism around the world. The database belongs to the Chicago Project of Suicide Terrorism, which is housed at the University of Chicago, USA. Both studies adopt a similar methodological approach to the study of the motivations of suicide terrorists, in that they draw primarily on media reports. Furthermore, these two studies were chosen because they reflect attempts to standardise a comprehensive dataset on suicide terrorism in two different cultural contexts. Israel and the USA are nations with immediate and critical concerns about suicide terrorism. Israel is facing one of the most sustained periods of suicide campaigns in recent years and, in 2001, the USA suffered one of the most publicised suicide terror events in recent history. Pedahzur and his colleagues (2003) analyse Palestinian suicide terrorists by comparing the suicide terrorists’ socio-economic characteristics with those of non-suicide terrorists. The researchers compiled a database of 80 Palestinian suicide terrorists and 743 non-suicide terrorists who participated in ‘successful’ terrorist acts during April 1993 to February 2002. Data was collated via content analysis of the Israeli newspaper Ha’aretz, and the articles about terrorism were coded according to seven variables: the terrorists’ previous experience in terrorism acts, type of education, ideological affiliation, age, marital status, socio-economic status (SES), and gender. The data were analysed using descriptive statistical analyses techniques and then cross-referenced against Durkheim’s typology. Where the Ha’aretz articles did not provide enough data on the individual terrorists, the researchers rely on terror organisations’ internet websites and other daily newspapers. The limitations of this methodology, however, are not reflected upon in the published analysis. Many researchers do not call attention to their methodological limitations, and so this criticism is not specific to Pedazhur and his colleagues. This criticism therefore reflects a wider limitation of all research, but, as this paper will argue, this limitation is one that carries special significance for the critical analysis of suicide terrorism studies. The researchers argue that suicide terrorism represents a new category of suicide, ‘fatalistic altruistic’ (2003: 407). In support of the altruistic suicide type, the study finds that the majority of the suicide terrorists in their sample had undertaken other acts of terrorism before their final mission of suicide. The researchers suggest that the suicide terrorists’ active membership history with their terrorist organisations, including their multiple missions prior to their suicide attack, shows the suicide terrorists’ high social integration and willingness to sacrifice themselves for their community. In support of the acute altruistic suicide type, which the researchers specifically use to refer to martyr (religious) suicides, the study finds that the suicide terrorists had high rates of religious education and religious membership in comparison to non-suicide terrorists. In support of the fatalistic suicide type, the researchers categorise the suicide terrorists’ lower SES and their minimal family connections as ‘fatalistic’, leading them to ‘assume that their [the suicide terrorists’] future orientation is geared more towards helplessness and vagueness’ (2003: 420). Photo by Pennello on Flickr. CC. Robert Pape (2005) compiled a database on suicide terrorists which he refers to as ‘the first complete universe of suicide terrorist attacks’: ‘More than a “list of lists”, this database probably represents the most comprehensive and reliable survey of suicide terrorist attacks that is now available’ (2005: 3-4; emphasis added). Pape documents 315 suicide terrorist attacks from around the world (involving 462 individuals) that occurred between 1980 and 2003. Data were compiled from print and on-line media reports in various languages. Pape ‘independently verified all the relevant information’ using official political reports on suicide terrorism and online reports from suicide terrorist groups (2005: 3, 201-202), but this qualitative data are not included in the published analysis. Pape finds that most suicide terrorist groups are secular, including the Liberation Tigers of Tamil Eelam (LTTE), the group most frequently engaged in suicide terrorist attacks of all terrorist groups in his database (2005: 4, 139). Pape was able to collect data on the ‘ideological affiliation’ of 384 of the 462 suicide terrorists in his sample. He found that of this subset group, 43 percent were religious and 57 percent were secular. Pape writes: ‘Suicide terrorism is not overwhelmingly a religious phenomenon’ (2005: 210). Nevertheless, Pape goes on to argue that suicide terrorism ‘is an extreme strategy for national liberation’ under three conditions: first, when a ‘national community’ is occupied by a foreign government; second, when that occupier is of a different religion to the terrorist group and the community it purports to represent; and third, when the foreign power is a democracy (2005: 80). Pape argues that religion is the primary construction of nationality, and so this religious nationalism explains the extreme response of suicide terrorism under foreign occupation (2005: 87-88). He explains how individuals are motivated towards suicide terrorism by applying Durkheim’s altruistic suicide type. suicide terrorists often claim, in martyr videos and other last testaments, to be motivated by altruism… The widespread existence of team suicide attacks suggests that many, possibly most, suicide terrorists are motivated, crucially if not wholly, by a collective purpose (2005: 187). In the studies described above, the altruistic suicide theory suggests that social integration and social approval are central to suicide terrorism. The researchers argue that ‘the suicide act appears to us a glaring example of altruistic behaviour’ (Pedahzur et al., 2003: 420; see also Pape 2005: 171-198). As the researchers see it, individuals are unlikely to be motivated to kill themselves as well as other people if their society does not see the cause as beneficial for the continuation of the community, and if that society does not honour and accept this voluntary death as a legitimate expression of martyrdom. Religious guidelines tightly regulate the concept of martyrdom, and the term martyr typically refers to a person who dies at the hands of their oppressors whilst defending their religion. According to the studies reviewed above, social support from the community makes it easier for terrorist groups to use religion to relabel these suicides as ‘martyrdom’ rather than as ‘sinful’, which, in principle, suicide is both in Christianity and in Islam. Pape (2005) refers to the murals, shrines and public commemorations of dead suicide terrorists as evidence of this community support (see also Kimhi and Even 2004). the youth culture from which the PSBs emerge, particularly in the Palestinian refugee camps, is not only conducive to solidarity but also highly masculine and competitive. That is, even when struggling ‘in the name of the community’ Palestinian youth do not lose their sense of individuality (2003: 76). Pedahzur and his colleagues (2003) and Pape (2005) dismiss the role that victimisation, trauma and aspirations for revenge may play in suicide terrorism, but Kimhi and Even’s (2004) study of 60 Palestinian suicide terrorists found that about half of their sample were motivated by personal social distress and personal suffering (see also Berko and Erez 2005; Speckhard and Ahkmedova 2006). These findings about trauma might suggest anomic, rather than simply altruistic suicide, but the data are especially interesting given that Kimhi and Even used the same methodology as Pedahzur and his colleagues and Pape, through content analysis of media reports. This suggests that, far from offering conclusive ‘facts’ about ‘the universe of suicide terrorism’ that awaits scientific measurement (cf. Pape, 2005), media reports vary, and they are also open to interpretation. The same datasets can therefore support different interpretations according to how the research questions are framed. The same criticism can be made of all research, but it is of particular significance for the purposes of the present analysis of suicide terrorism. The use of media reports to interpret terrorist actions and motivations present epistemological problems that social researchers and intelligence analysts must become more reflexive about, especially in regards to their interpretations of the ‘biographies’ of individual suicide terrorists. Media reports fill a significant void, as data on terrorism are otherwise scant, but these data need to be treated critically. Media reports are constructed within specific political contexts and directed towards their editorial and target audience readerships. They are not necessarily good sources of information about individual motivations; they are representations of such motivations from the people survived by the suicide terrorists. While this data are interesting and worthy of scholarly analysis, they tell us more about how the terrorists’ social network understands their actions in hindsight, rather than giving us a definitive, holistic insight into the personalities and ‘true’ intentions of suicide terrorists. Pedahzur and colleagues (2003) and Pape (2005) also rely on terrorists’ reports and testimonials and, while these are important avenues of research, such data are constructed by the terrorists to suit their ideological goals; they do not conclusively prove a process of altruism and a culture of martyrdom. Qualitative methodologies, including interviews and discourse analysis, generate valid data, but the focus of this critique is on what researchers do with such data and how this data is represented. Two epistemological issues are highlighted: one is about thinking critically about the available data on suicide terrorism; and the other is about the conceptual framework that researchers use in their analyses. The historical and cultural understandings of suicide terrorism must be understood within an explicit epistemological framework, and in the context of specific communities and groups that practice suicide terrorism. It is difficult to gain any insight into a culture of martyrdom, or critically question if such a thing exists, without first understanding how communities are constructed. Furthermore, instead of simply asking why people become suicide terrorists (a difficult process to measure in the case of successful suicide terrorists), researchers should also ask why so few people who are exposed to the ‘root causes’ of terrorism in different parts of the world actually become suicide terrorists. To this end, John Horgan writes that ‘we cannot hope to examine terrorism outside the context in which it takes place’ (2005: 71). The purpose of the ongoing research from which this paper is drawn is to develop a critical sociological framework to achieve a better understanding of suicide terrorism. Rather than attempt to describe the ‘reality’ of suicide terrorism, the research being conducted suggests a culturally-specific framework for understanding the motivations of suicide terrorists, drawing on the sociology of suicide, empirical studies on altruism, and sociological theories of community. For example, given that Durkheim identifies military suicide as the exemplar of altruistic suicide, why is it that, in ‘Western’ societies, we revere war heroes and immortalise their deaths with medals and mythology, and yet suicide terrorism is viewed as some unfathomable act of immorality? This is due to current frameworks, which define the political violence perpetrated by insurgent individuals and groups as ‘terrorism’, but political violence sanctioned by the state is not defined as ‘terrorism’. Western and other societies make a distinction between the altruism of a soldier’s death during war and the intentions of individual suicide terrorists primarily because, while a soldier might perceive their death as a potential outcome of the mission, a suicide bomber perceives their death as an integral part of the mission. Beyond this distinction, the altruistic character of these deaths derives its meaning from the cultural and political contexts in which they take place. The different responses to murder during war and murder via suicide terrorism are the consequence of the political construction of language. The ubiquitous phrase ‘one person’s terrorists is another person’s freedom fighter’ remains evocative because it draws our attention to the ways in which interest groups use language to classify similar acts of violence in different lights in order to further their political interests. In order to deepen our understanding of suicide terrorism as a social practice, it might be useful to consider how the processes that motivate soldiers to die for their country, and inspire individuals to help strangers in their communities through volunteering and blood donation, may have some overlap with the motivations of suicide terrorists. My research explores the parallels between suicide terrorism and the literature on altruism not to make an unequivocal and transferable link between these two processes, but to identify how empirical insights on altruism may assist in understanding the motivations of suicide terrorists. This is an attempt to break down the process of ‘otherness’ that currently limits our understanding of terrorism more broadly. The concept of otherness is used in postcolonial studies to explore the ‘us and them’ dichotomy used by Western colonial nations to delineate ‘The Self’ (our shared values and culture), from other groups. ‘The Other’ signifies ‘an alien subjectivity’ that we ascribe to those whom we perceive to be inherently different to ourselves (Spencer 2006: 8). Terrorism must be understood not only in terms of social context, but also in context of the researcher as a situated being. Researchers and intelligence analysts embody place, time and culture and this affects the way in which they interpret data. Durkheim’s typology represents a useful framework, but it needs to be applied in relation to the context in which suicide terrorism occurs and in reference to the situated researcher/analyst. Currently, suicide terrorism analyses that employ Durkheim’s conceptualisation of altruistic suicide are not engaged with a critical evaluation of the typology. What does it actually mean that suicide terrorism is motivated by altruism and how might it help prevent future suicide campaigns? Durkheim’s typology is useful to the analysis of suicide terrorism as a conceptual framework for exploring the integrative and regulatory social dynamics and the social institutions which influence suicide. Furthermore, the framework is helpful specifically because it is intended for cross-cultural and historical-comparative purposes. Nevertheless, Durkheim’s typology must be placed in its original Western context – if we apply this framework to the suicide terrorism acts being committed by people from non-Western cultures, we must be engaged in a critical investigation of the multiple meanings attached to the act of suicide terrorism and to the various cultural interpretations of the concept of altruism. Berko, A. and E. Erez (2005) ‘“Ordinary People” and “Death Work”: Palestinian Suicide Bombers as Victimizers and Victims’, Violence and Victims 20(6): 603-623. Durkheim, E. (1979) Suicide: A Study in Sociology. G. Simpson (ed. ), J. A. Spaulding and G. Simpson (transl.). New York: The Free Press. Hage, G. (2003) ‘“Comes a Time We Are All Enthusiasm”: Understanding Palestinian Suicide Bombers in Times of Exighophobia’, Public Culture 15(1): 65-89. Hafez, M. M. (2006) ‘Rationality, Culture, and Structure in the Making of Suicide Bombers: a Preliminary Theoretical Synthesis and Illustrative Case Study’, Studies in Conflict and Terrorism 29(2): 165-185. Horgan, J. (2005) The Psychology of Terrorism. London: Routledge. Kimhi, S. and S. Even (2004) ‘Who Are the Palestinian Suicide Bombers?’, Terrorism and Political Violence 16(4): 815-840. Pape, R. (2005) Dying to Win: The Strategic Logic of Suicide Terrorism. Carlton North: Scribe Publications. Roberts, M. (2005) ‘Tamil Tiger “Martyrs”: Regenerating Divine Potency?’, Studies in Conflict and Terrorism 28: 493-514. Speckhard, A., N. Tarabrina, V. Krasnov and K. Akhmedova (2004) ‘Research Note: Observations of Suicidal Terrorists in Action’, Terrorism and Political Violence 16(2): 305-327. Speckhard, A. and K. Ahkmedova (2006) ‘The Making of a Martyr: Chechen Suicide Terrorism’, Studies in Conflict and Terrorism 29(5): 429-492. Spencer, S. (2006) Race and Ethnicity: Culture, Identity and Representation. London: Routledge. Webel, Charles P. (2004) Terror, Terrorism, and the Human Condition. New York: Palgrave Macmillan. Zevallos, Z. 2006. ‘What Would Durkheim Say? Altruistic Suicide in Analyses of Suicide Terrorism’, in V. Colic-Peisker and F. Tilbury (Eds) Sociology for a Mobile World: Proceedings of The Annual Conference of The Australian Sociological Association 4-7 December. Perth: University of Western Australia.